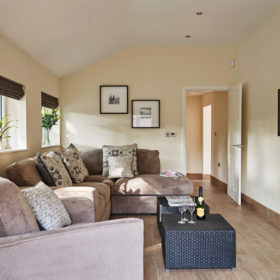 Langtons in sleepy Wrea Green is the perfect modern indulgence for quiet groups looking for relaxation, recreation and reinvigoration. 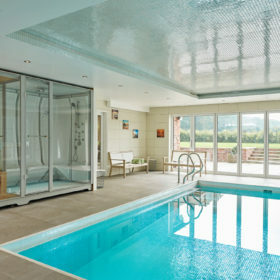 Waste a few hours in the heated pool, sauna and steam room. Sip cocktails in the bar room. 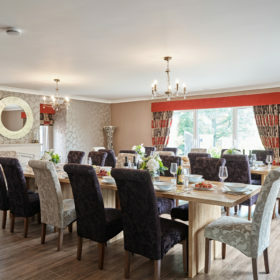 Get round the twin dining tables and let the corks pop and the conversation flow as smoothly as the Claret. The chandeliers glint, the surfaces gleam and the curved staircase stands ready for you to make an elegant entrance after you’ve dressed for dinner. 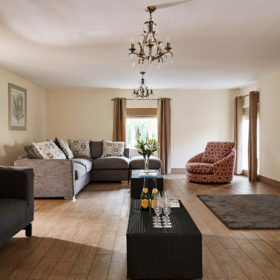 Sleeping 26, Langtons in sleepy Wrea Green is the perfect modern indulgence for quiet groups looking for relaxation, recreation and reinvigoration. Waste a few hours in the indoor heated pool with its swim and massage jets, internal illumination, tilt-and-turn side windows and sun doors onto the terrace. 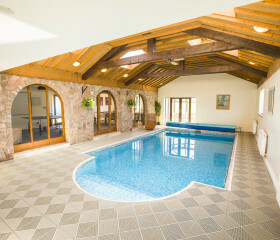 Swim at night and soak up the atmosphere from the sound system and downlights. Complete the indulgence in the sauna and steam room. Chilled enough yet? Get together around the twin dining tables and let the corks pop and the conversation flow as smoothly as the Claret. 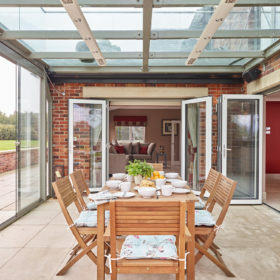 Fold back the doors from the kitchen and enjoy the garden, whatever the weather, in the glass room. Or spread out around the south-facing sun terrace with its water feature and lights. 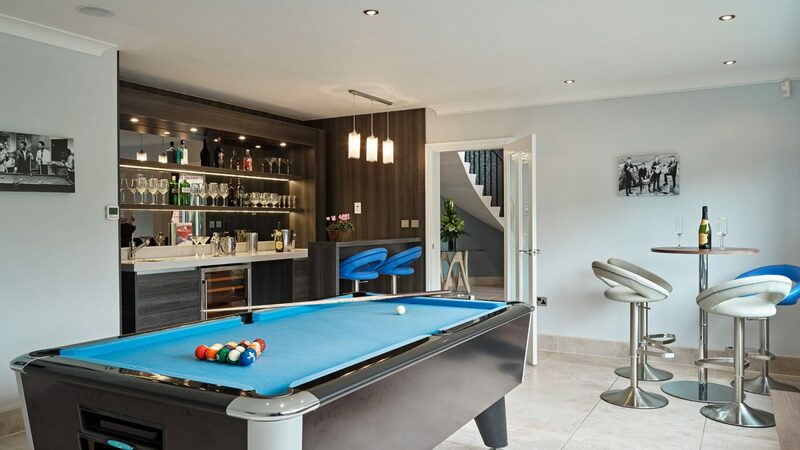 Shoot some pool in the bar room with its Siematic cocktail bar and wine-cooling fridge. Dial up a rom-com in the movie room. Have music wherever you go, with sound wired to every room. Curl your toes above the toasty underfloor heating. 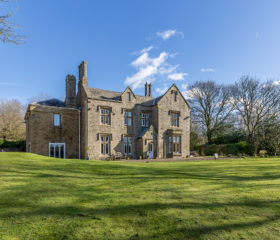 Langtons is the height of urban cool, in the still of the Lancashire countryside. 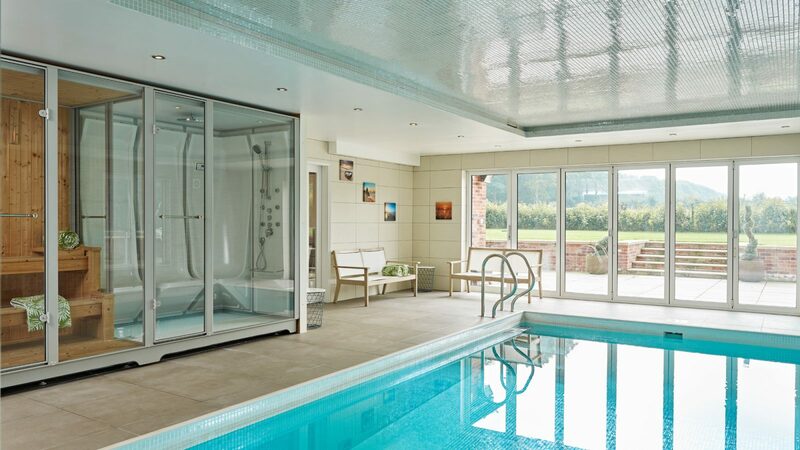 With its swim and massage jets, mosaic tiles, internal illumination, tilt-and-turn side windows and bi-fold sun doors onto the terrace, the indoor heated pool here is all glitz and glam. At night, the Halogen downlights and sound system set the mood to special. Off to one side sits the steam room, seating three, with hand and body showers. The sauna cabinet adjoins. 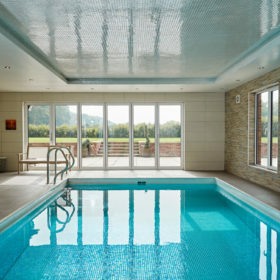 Get sweaty, shower off, then swim for England in the 12 by 13-foot pool. Anti-slip flooring and side steps ensure safety, and there’s convenience in the adjoining changing room with wet room and showers. 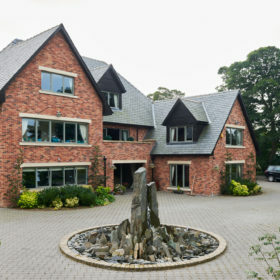 Outside, all is lovingly landscaped. The block-paved driveway comes with water feature and lighting. Out the back, sun yourself all day on the south-facing limestone terrace. At night, wrap up a little and sit out with the lights from the low walling illuminating the night and the swooping of the bats. For that all-year-round outdoor feeling, the Glass Room is the place to drink and dine. 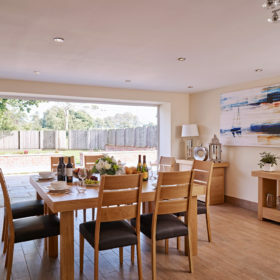 Slide back the doors, turn up the heating and enjoy the garden, whatever the weather. Close the double doors with a reassuring thud and admire the feature hallway with its porcelain-tiled floor. Feel the warmth from the underfloor heating. Glide up the bespoke Portuguese floating staircase with curved wrought-iron balustrade. Notice the wall-mounted heating and lighting control panels and ceiling speaker system. 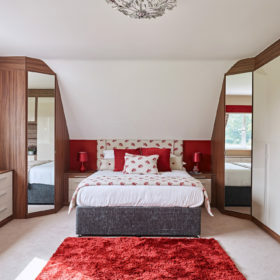 It’s a theme that continues throughout, with every room and the garden wired for sound, with inset ceiling-mounted speakers and ipod docking stations. 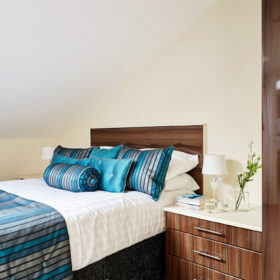 Kick off your shoes, because every room comes with toasty-toed underfloor heating. 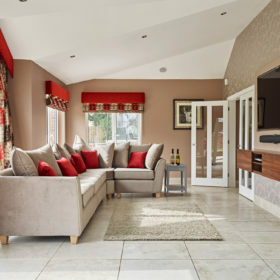 Open the double doors to the lounge, where the sofas are plumped and ready, the widescreen TV’s on standby and the tasteful décor runs throughout. 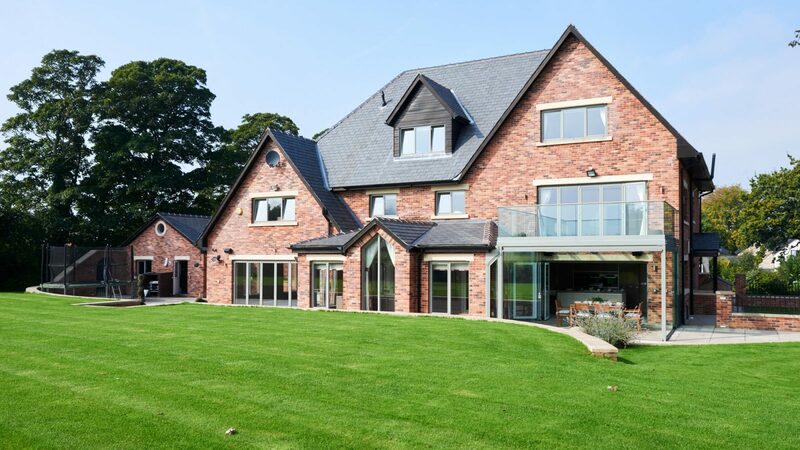 Tilt-and-turn double-glazing offers views of the front and side landscaping. Wriggle your toes in your socks in front of the solid limestone fireplace with gas fire. 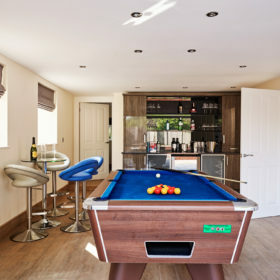 Shoot pool and mix drinks in the games room. 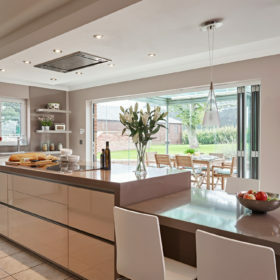 This is a fun and funky room with fitted Siematic cocktail bar, double wine-cooling fridge and adjoining breakfast bar. Pick a perch, take a sip and wait for your next shot. Ceiling downlighting and your choice of sounds from the speaker system complete the sense of urban cool. Can’t cook, won’t cook? 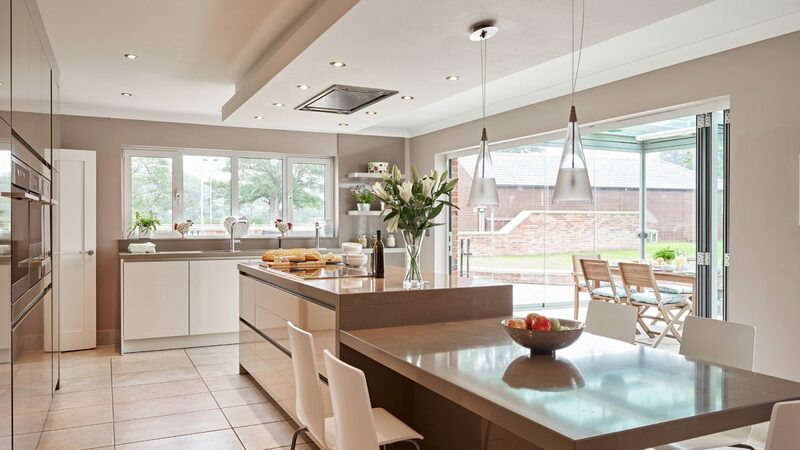 You’ll want to give it a go here amid the Siematic dining kitchen with Silestone working surfaces. 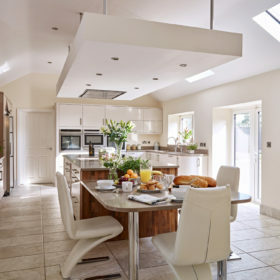 There’s a centre island with illuminated extractor canopy, halogen downlights and Miele integrated appliances. This is a world of fan-assisted double ovens, induction five-ring hob, plate-warmers and integrated dishwasher, fridge and freezer. There’s instant boiling water on tap and a walk-in pantry with open shelving. Light floods in from the sliding plate-glass doors that entice you out to the sun lounge. Special occasion? 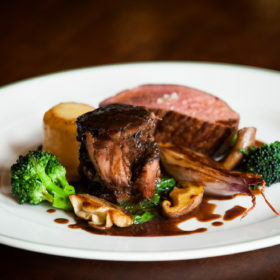 Our chefs from Twelves or Rowley’s can step in while you shoot some pool or just the breeze. It all gets served up around the two monster tables in the dining room seating 28, in the glass room or out on the terrace. It’s convivial, contemporary and conducive to feeling fabulous. Eating out? The Grapes is great for pub classics and a pint while catching the cricket on the green. 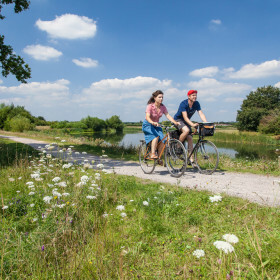 Try some lamb cutlet or hake fillet at The Villa in the village, or head to Lytham to Spago for a taste of the Med, or The Taps, home of charity bike rides, CAMRA awards and salt-and pepper squid. 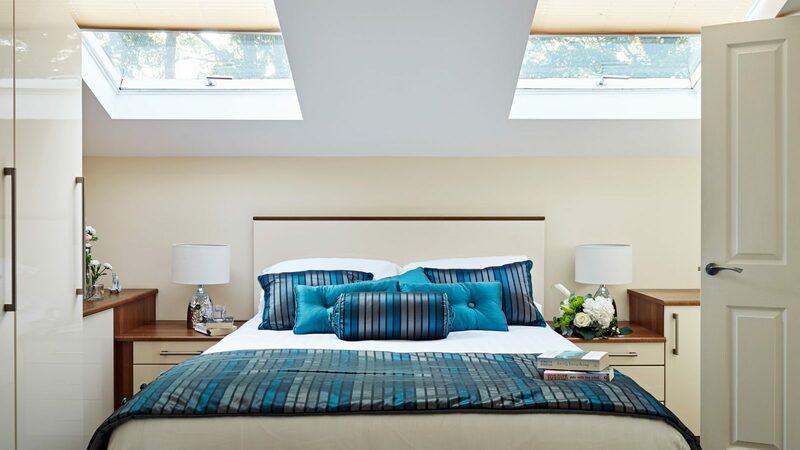 Battle over the master suite, with its fitted Hammond wardrobes with centre illuminated drawer unit, dressing room and bi-folding doors out to the glass-floored sun balcony. Across the stainless glass balustrade, the views of the gardens and equestrian centre are best accompanied by morning coffee and croissants. 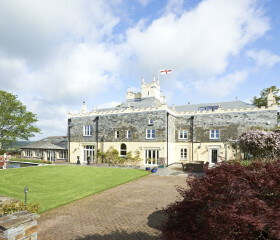 Langtons sleeps 26 in the main house and barn conversion, and it’s all as well-appointed as the master. 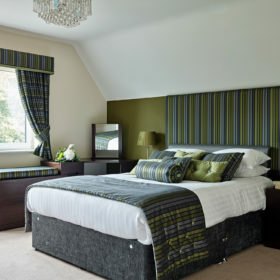 Bedroom two, in the barn, is also a suite with dressing room and freestanding bath. 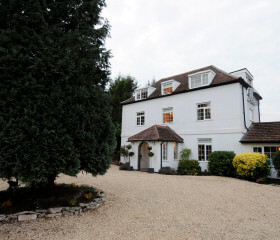 Four further bedrooms are kings, there are four doubles, two twins and two sofa beds. 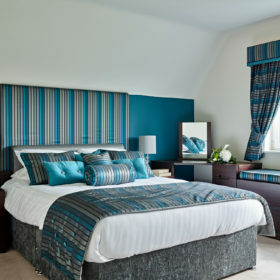 Wherever you lay your head, it’ll be on plump pillows, wrapped in soft cotton bedding with ceiling speakers above you. Through the window, the gentle sway of the oak-tree branches in the breeze is the sound that’ll send you blissfully off to sleep. 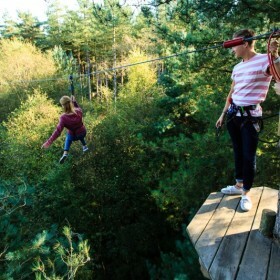 Shoot clay at Blackpool Gun Club, get into some great golf at Open Championship course Royal Lytham, hack off-road with Wrea Green Equestrian Centre, or Go Ape at Rivington. 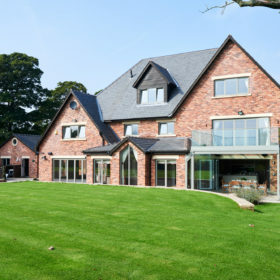 Catch global names at the Lytham Festival and sip cocktails at Uber in posh Poulton or Lytham’s Loft. This is city chic without the city.